Most commercial, industrial and institutional roofs are flat roofs. Thousands of square feet of flat roof are installed each year in Mississauga, Brampton and the Greater Toronto Area and many of them are rarely maintained. The flat roof only gets attention when it makes itself known, and the only time that happens is when it begins to leak. Once a flat roof leak begins, it will saturate the insulation beneath it, diminishing the R-value of the ceiling’s insulation and adding unneeded heating and cooling costs to a building. If the flat roof leak is left untreated and gone unnoticed, it can lead to interior damage, mold, insect and animal entry and ultimately lost productivity and damage to important company assets. Luckily, our flat roof leak inspection services are a very quick and easy way to locate the source of moisture problems. Flat roof leak inspections allow us to eliminate false or misleading assumptions, such as incorrectly attributing leaks to the flat roofing system when the water is actually entering the building through the exterior walls. If the source of moisture is identified incorrectly, the flat roof may be repaired and serviced pointlessly several times in an attempt to find the location of the leak. As the leaks continue, more interior finishes will be damaged, and the cost for flat roof repairs will escalate. If it is found that the area of wet roofing exceeds about 25 percent of the total roof area, the cost of repairing the wet areas begins to approach the cost of flat roof recovery or complete tear-off, making these options justifiable. If the subsurface moisture is extensive — 30 to 35 percent or more of the entire flat roof area — it is highly recommended that a flat roof recovery or flat roof replacement be completed. In any case, the source or sources of moisture must be found and confirmed; otherwise, the conditions may return soon after the membrane is replaced. Countless times we have been called to a roof to repair an already repaired area which shows that other contractors are still guessing where the leak is coming from. 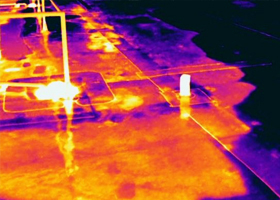 With thermal imaging, there is no guessing. 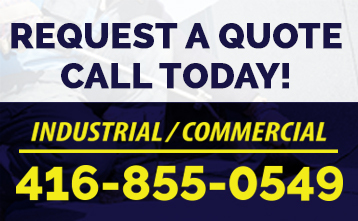 If you are seeking professional flat roofing services and would like to request a free estimate, call 416-855-0549.